Happy Monday my beady friends! 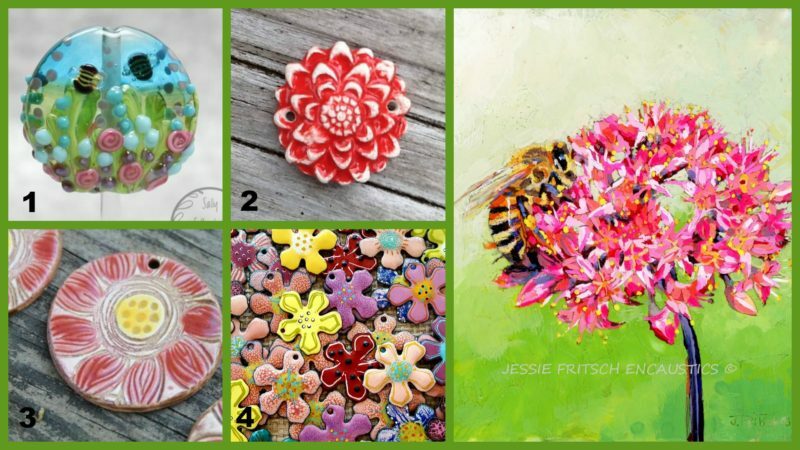 Despite it being April Fool’s Day, I’m not fooling around when it comes to sharing some art bead inspiration with you for Art Journey Three! I’ve been buzzing with excitement for this one since I first saw this year’s artwork as I just adore bees. 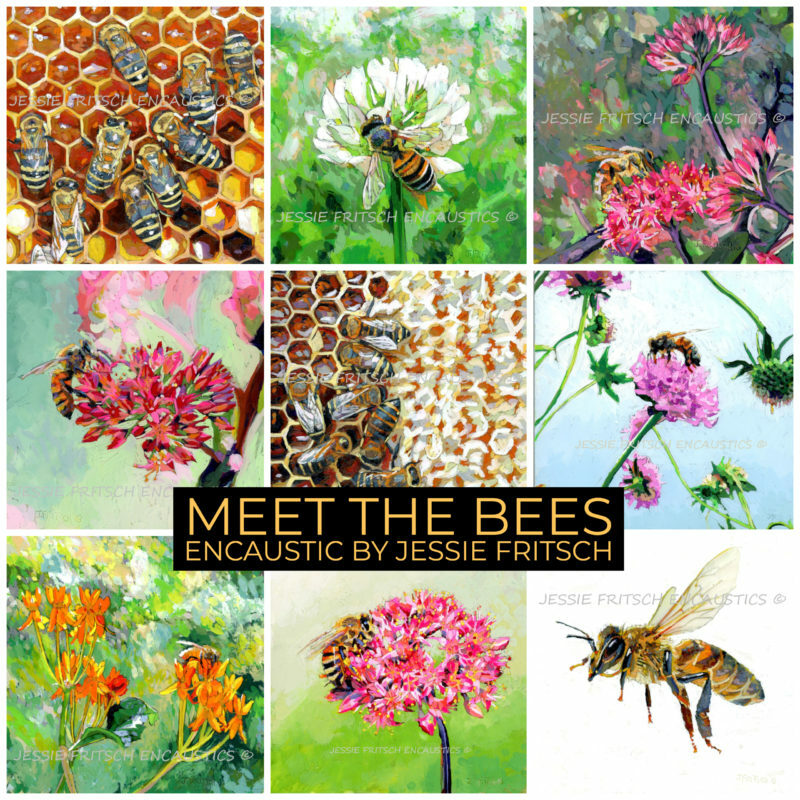 Jessie Fritsch really captured the beauty and wonder of the honey bee. I’d love to see her work in person some day, for now you and I both can enjoy (and buy) her work HERE. 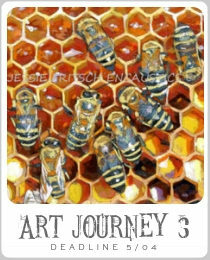 I hope that this post will help give you some ideas and get you creating like busy little bees for this new Art Journey! Here’s my standard caveat: This isn’t in any way meant to be exhaustive or a shopping list… I realize that some of these makers are outside of the U.S. and that it’s always possible that not all my picks will still be available by the time you see this post. That being said, I’m providing a link to each artist’s shop in the photo captions for you. Bees are amazing little creatures… and there are so many different kinds. Honey bees are just one of over 20,000 known species of bees!! Honey bees are important pollinators, makers of honey, and builders of hives. They aren’t aggressive by nature and only sting to protect the hive or if unduly provoked. (Unfortunately, accidentally stepping on them counts as provoking them and I’ve managed to get stung a couple of times that way.) 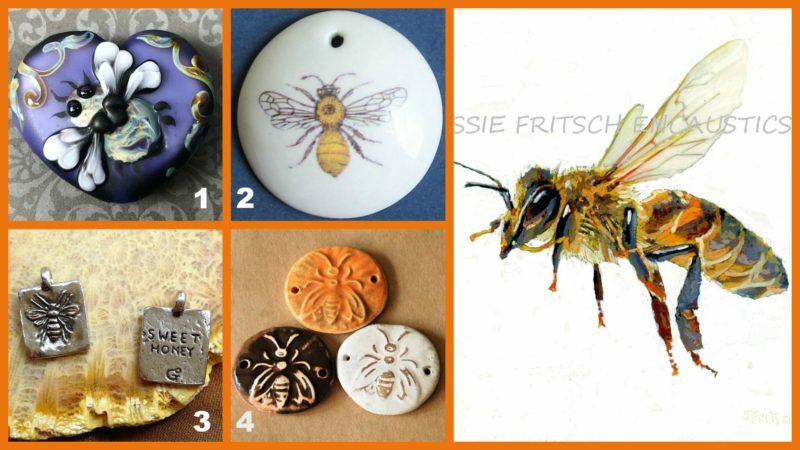 Bees are our friends and I just love art beads that celebrate them! I was glad to see that some of Jessie’s artwork took a peek inside the hive… that opens up a ton of possibilities design wise. Honeycomb (or interlocking hexagons) is such a striking pattern, but the bees don’t build that way because it’s pretty! Hexagonal cells are very strong and super efficient as far as space usage goes. 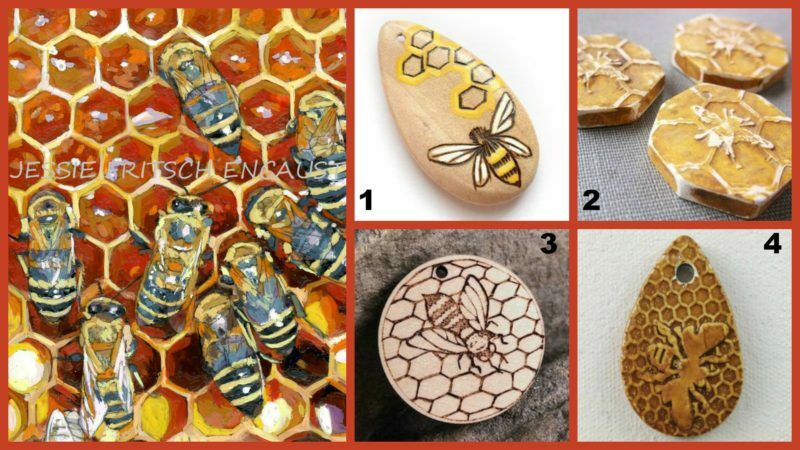 Here are just a few beads that celebrate our bee friends with their honeycomb. 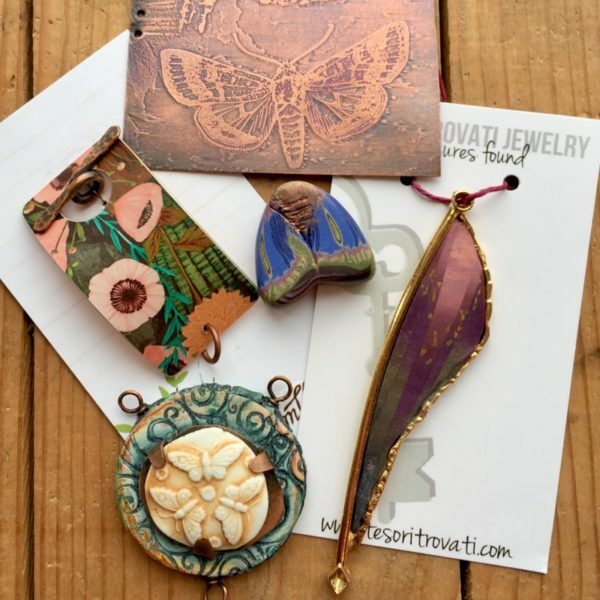 Not super excited about designing with insect motifs? No problem! You can put your focus on the floral aspects and bright colors in the artwork instead. Play off the flower shapes, the color palettes, or just the idea of flowers in general! Remember, the only hard and fast rule of the Art Journey Challenge is to use at least one art bead. Not satisfied with just the more general flower motifs, I really wanted to find some beads that felt like the clover in Jessie’s artwork. 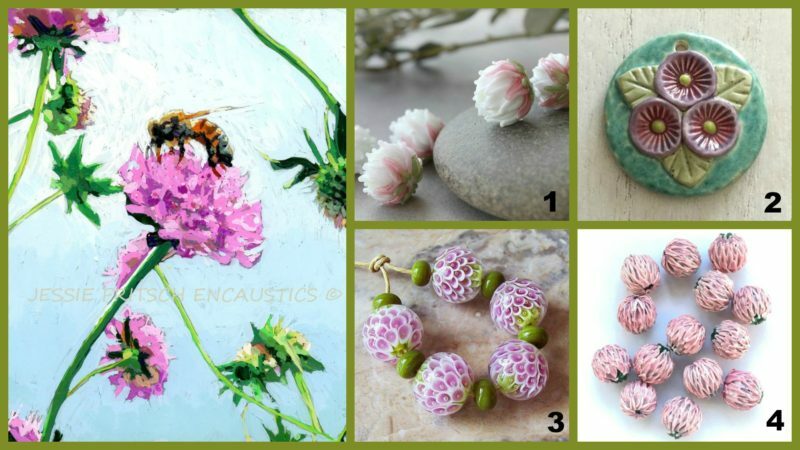 Doing some deeper searching, I found three different lampwork artists with different takes on clover flower beads… from hyper-realistic to more stylized. 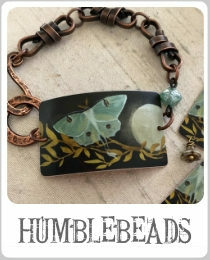 I don’t think that Lesley Watt’s adorable pendant is meant to be clover, but I put it in this section due to its coloration. Artistic license, right? 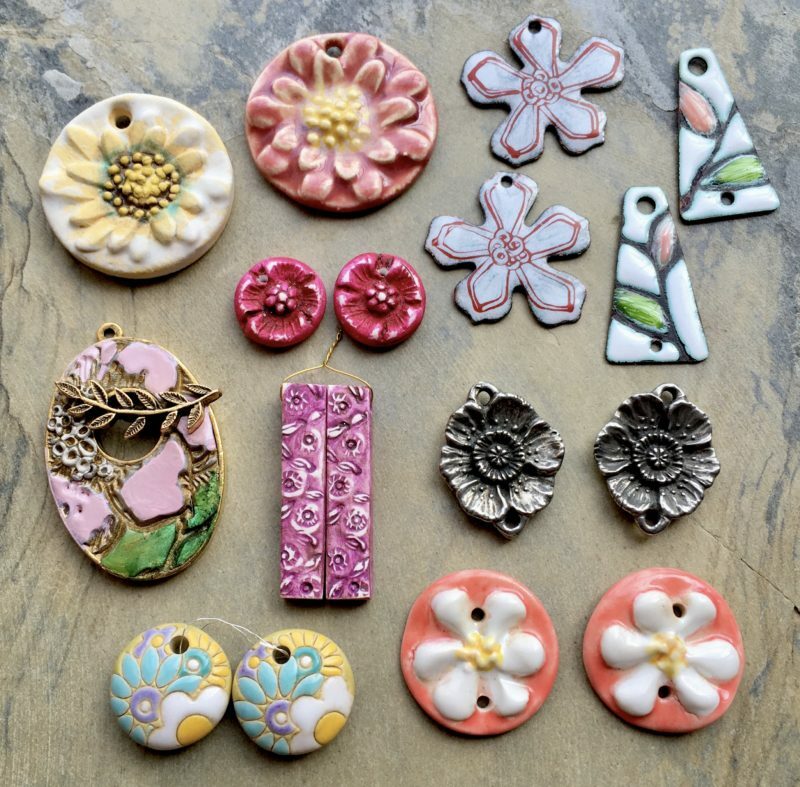 Before I head off to get my week started, I wanted to share a peek at the beads that I’ve found in my collection for consideration this month. 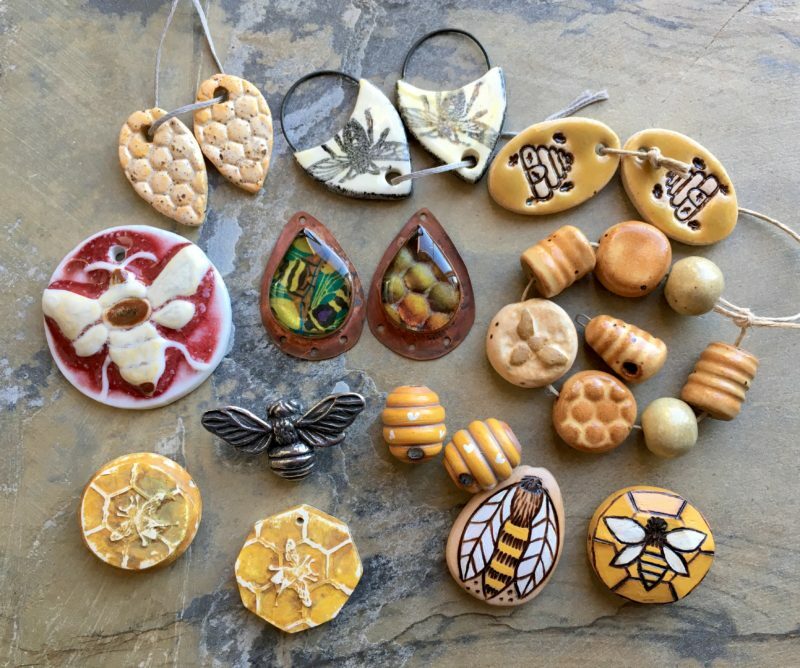 Full disclosure… after I took the first picture I found even more bee themed art beads hiding! I may have a tiny bee addiction. 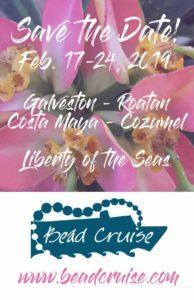 While I have a ton of floral beads, I had a harder time pulling out things that felt completely right to me. All of these work, but we’ll see what I end up feeling when I sit down at my bead table. I’ll be back in two weeks to show you all what I’ve made for this Art Journey. I hope you’ll be busy creating for this amazing Journey as well… I can’t wait to see what everyone dreams up. Buzzing off for now! 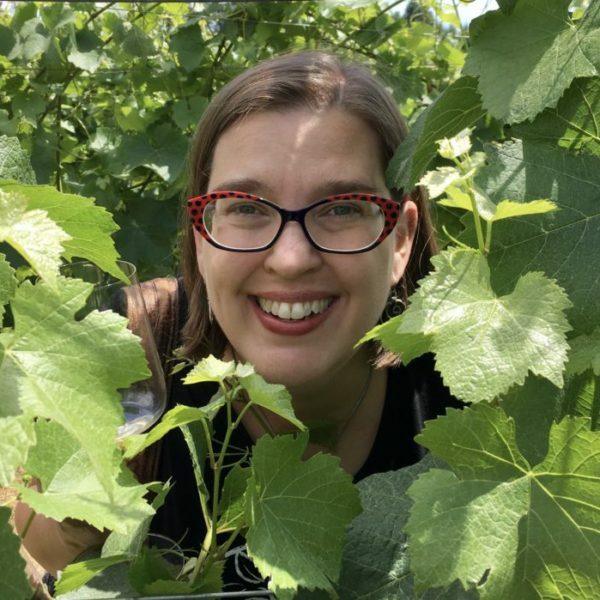 Monday Musings: New to the Team!